This post is part of the “How To Recover From A Financial Mistake” series here at JosephSangl.com. Click HERE to read the entire series of posts. Raise your hand if you’ve ever made this mistake. I remember graduating college and running down to the car lot to purchase a new vehicle. My twin brother and I had been sharing two cars: a 1981 Datsun B-210 and a 1986 Pontiac Firebird. They weren’t in very good condition after enduring years of abuse from us. I went to the new car lot and purchased a brand new 1997 Chevrolet Cavalier. I even bought one to reflect my allegiance to the mighty Purdue Boilermakers. It was painted black with a metallic fleck in it, and I had a gold pinstripe added to it to reflect the Purdue Black & Gold colors. It was a financial mistake. With student loans, credit card debt, engagement and wedding ring debt, and an approaching wedding and honeymoon to help pay for, it turned out only to compound my financial woes. So, how does one recover from this financial mistake? Consider employing one of the following methods. “Sell it” Method Sell the car, absorb the financial loss, and purchase a used car. “Attack the debt” Method Adjust budget so you can swiftly pay off the car and then drive it for at least four more years after completing pay-off. Determine the true value of the vehicle. This is an important step. The owner of the vehicle will invariably over-value their car and potential buyers will naturally under-value it as they seek a good deal. Kelley Blue Book is a terrific resource for understanding the true market value of your vehicle. Find $7,000 to bridge the “negative equity gap” This could be a combination of a 401(k) loan, tax refund, selling some stuff, or working an extra job. This is a challenging step for many people, but it is definitely achievable! Find a buyer who will pay the true value of $19,000 for the car You will be able to put the $19,000 from the purchaser with $5,000 of the $7,000 you’ve gathered in Step #2 so the lender can be paid in full. This provides a clear title to the purchaser and eliminates your car note. Purchase an “I’m fixing my financial situation” car with the remaining $2,000 Now, it is imminently clear that a $2,000 car is nowhere near as nice as a $25,000 vehicle, but it is amazing on a budget. Save the monthly payment for the next two years and upgrade. By saving $564 for the next two years, this family will have $13,536 to upgrade their ride – with cash money and zero debt! Presto! You’ve fixed your financial mistake! “Attack the debt” Method This approach requires diligence and changes to the monthly budget in order to pay off the vehicle in a swift manner. For example, suppose a person has purchased a $25,000 car of which they still owe $24,000. Their monthly payment is $564 for 48 months. Here is how they can fix their financial mistake. Eliminate costs from budget and apply savings to the car payment. Suppose this family decided to reduce their cable television services, eliminate their home phone, cease their gym membership they haven’t been using anyway, and reduce their visits to restaurants. By taking these steps, they are able to apply an extra $300 per month toward their car payment. Focus. Focus. Focus. Nothing of significance really happens without great perseverance. By sticking to this for just 29 months, the vehicle will be paid off! Drive the car for another 4 years and pay the car payment to yourself. Reward yourself for paying your car off by adding the $300 savings back into your budget for other items, but continue paying the $564/month payment to yourself. In just four years, you will have saved $27,072 for your next car! 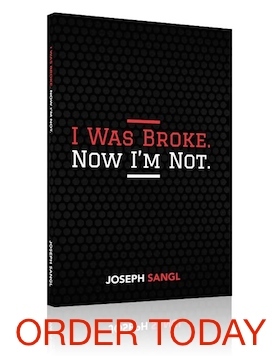 If you are interested in learning how to take your finances to an entirely new level, I encourage you to check out the study I have written called I Was Broke. Now I’m Not. The study can be completed as a group or on an individual basis. If you are serious about changing your financial future, check out the study HERE. Or… Quit making payments on the car. Usethe money you would have used for the car payments to buy a cheap used car. Deal with the fact that you will have this on your credit report for seven years, but it really doesn’t matter because you have vowed to never take out a loan for a car ever again.